The George Washington Bridge over the Hudson River opens to public traffic. The George Washington Bridge is a double-decked suspension bridge spanning the Hudson River and connecting between the Washington Heights neighborhood of Manhattan in New York City with the borough of Fort Lee in New Jersey. As of 2016, the George Washington Bridge carried over 103 million vehicles per year, making it the world’s busiest motor vehicle bridge.It is owned by the Port Authority of New York and New Jersey, a bi-state government agency that operates infrastructure in the Port of New York area. The George Washington Bridge is also informally known as the GW Bridge, the GWB, the GW,or the George[and formerly as the Fort Lee Bridge or Hudson River Bridge. A bridge across the Hudson River was first conceived in 1906. In early 1925, the state legislatures of New York and New Jersey voted to allow for the planning and construction of such a bridge. Construction on the George Washington Bridge started in October 1927; the bridge was ceremonially dedicated on October 24, 1931, and opened to traffic the next day. The opening of the George Washington Bridge contributed to the development of Bergen County, New Jersey, in which Fort Lee is located. The current upper deck was widened from six to eight lanes in 1946. The six-lane lower deck was constructed beneath the existing span from 1958 to 1962 because of increasing traffic flow. The George Washington Bridge, an important travel corridor within the New York metropolitan area, has an upper level that carries four lanes in each direction and a lower level with three lanes in each direction, for a total of 14 lanes of travel. The speed limit on the bridge is 45 mph. The bridge’s upper level also carries pedestrian and bicycle traffic. Interstate 95 and U.S. Route 1/9 cross the river via the bridge. US 46, which lies entirely within New Jersey, terminates halfway across the bridge at the state border with New York. At its eastern terminus in New York City, the bridge continues onto the Trans-Manhattan Expressway. Posted in Uncategorized	| Tagged 1931, 24 October, The George Washington Bridge over the Hudson River opens to public traffic. The Empire State Building is dedicated in New York City. On this day in 1 May 1931, President Herbert Hoover officially dedicates New York City’s Empire State Building, pressing a button from the White House that turns on the building’s lights. Hoover’s gesture, of course, was symbolic; while the president remained in Washington, D.C., someone else flicked the switches in New York. The idea for the Empire State Building is said to have been born of a competition between Walter Chrysler of the Chrysler Corporation and John Jakob Raskob of General Motors, to see who could erect the taller building. Chrysler had already begun work on the famous Chrysler Building, the gleaming 1,046-foot skyscraper in midtown Manhattan. Not to be bested, Raskob assembled a group of well-known investors, including former New York Governor Alfred E. Smith. The group chose the architecture firm Shreve, Lamb and Harmon Associates to design the building. The Art-Deco plans, said to have been based in large part on the look of a pencil, were also builder-friendly: The entire building went up in just over a year, under budget at $40 million and well ahead of schedule. During certain periods of building, the frame grew an astonishing four-and-a-half stories a week. At the time of its completion, the Empire State Building, at 102 stories and 1,250 feet high 1,454 feet to the top of the lightning rod, was the world’s tallest skyscraper. The Depression-era construction employed as many as 3,400 workers on any single day, most of whom received an excellent pay rate, especially given the economic conditions of the time. The new building imbued New York City with a deep sense of pride, desperately needed in the depths of the Great Depression, when many city residents were unemployed and prospects looked bleak. The grip of the Depression on New York’s economy was still evident a year later, however, when only 25 percent of the Empire State’s offices had been rented. In 1972, the Empire State Building lost its title as world’s tallest building to New York’s World Trade Center, which itself was the tallest skyscraper for but a year. Today the honor belongs to Dubai’s Burj Khalifa tower, which soars 2,717 feet into the sky. On Oct. 17, 1931, the Chicago mobster Al Capone was convicted on five of 23 income tax evasion counts he faced, and which later yielded an 11-year prison sentence. During the trial, Mr. Capone’s efforts to avoid a strict sentence were thwarted by Judge James H. Wilkerson, who refused to offer a lenient sentence in exchange for a guilty plea. Wilkerson also swapped out the jury after Mr. Capone tried to bribe the people who were serving on it. 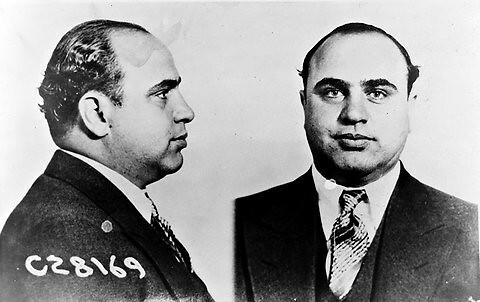 Capone’s actions made him an obvious target for federal authorities. Having been convicted in 1929 of a weapons charge, he used his influence to secure a comfortable prison cell in which to serve his short sentence. He was not so lucky the second time around: he was closely guarded in several prisons, including Alcatraz. He was released in 1939, but by then his health had seriously declined as a result of having contracted syphilis. He was unable to return to mob life and died in 1947. The George Washington Bridge that links New Jersey and New York is opened.